Beachbody's Slimming Formula: Great For Slim in 6! Beachbody’s Slimming Formula is an excellent weight loss and weight management supplement that will help you speed up your workout results in a safe and natural way. This formula contains a signature blend of Green Tea Extract and Pyruvate, which will boost your metabolism and promote both fat and weight loss. 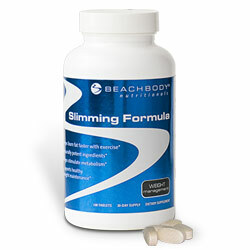 The Beachbody Slimming Formula is part of the recommended supplement line for the Slim in 6 Rapid Results program. Why is the Slimming Formula Unique? The Slimming Formula's ingredients are all natural and perfectly combined to jump start your metabolism, increase the rate at which you burn fat in a healthy way, without the dangerous side effects of ephedrine or the nasty side effects of other diet pills, fat-inhibitors, or appetite suppressants. With this powerful formula you will reach your weight goals and keep the results for the long term. How will Beachbody’s Slimming Formula Help you? This supplement contains green tea extract, which naturally helps increase metabolism and enhances antioxidant activity. It also includes pyruvate which supports maximum fat loss, lean-muscle development, improves endurance, reduces cholesterol and helps your body fight back fat. These potent antioxidants support your immune system and will help you fight physical stress and delay the aging process. Just two tablets a day before each meal.